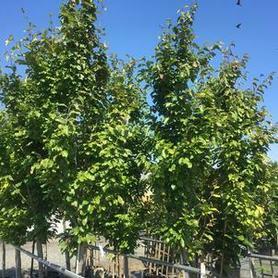 'Vanessa' Persian Ironwood was chosen for its upright, columnar form. Parrotia 'Vanessa' has multi-season appeal, starting in winter and spring when attractive mottled bark is offset by small red spidery flowers. 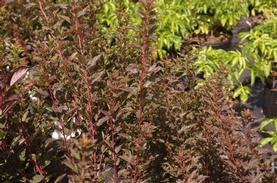 The oval shaped foliage emerges in spring with burgundy edges to the scalloped leaves. By summer the foliage is a bright green, taking on stunning shades of red, purple, orange and gold in fall. Chinese Parrotia or Ironwood is a very rare large shrub or small tree which is highly endangered in its original Chinese habitats. Brought to England by Roy Lancaster, who received this clone from Mikinori Ogisu, the Japanese Botanist. Tim Brotzman, the Ohio nurseryman who is a leading expert on Hamamelis, provided this rarity to us. The green leaves in summer often have a striking purple margin. The fall color is really spectacular, in shades of red, pink and burgundy. Parrotia subaequalis is more compact than P. persica, but has more showy exfoliating bark as it matures. The infrequently appearing red filamentous flowers in winter are similar to Parrotia persica. 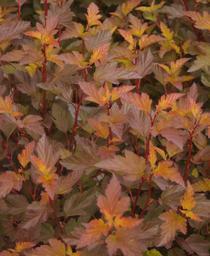 Coppertina® ('Mindia') Ninebark has light pink flowers in June, copper-colored foliage and good red fall color. It comes from Minier Nursery in France. Physocarpus is also wet site tolerant, and the peeling winter bark increases in showiness as Ninebarks age. 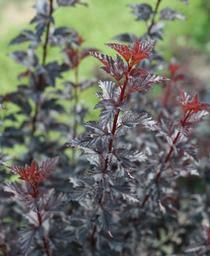 Summer Wine® 'Black' is the darkest Physocarpus on the market to date. The foliage is such a dark purple that it approaches black, and the delicate pink flower clumps really stand out in contrast when they appear in June. As the leaves mature throughout the summer, they take on some more bronzy tones, followed by showy reddish purple fall color. If desired, pruning is most appropriate right after blooming. Tiny Wine® ('SMPOTW') Dwarf Ninebark is a dwarf form of our native Physocarpus, with burgundy to bronze foliage. The flowers start opening in late spring, forming bunches of pink and white button-like flowers by June. 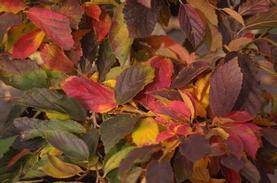 The showy purple bronze summer foliage is followed by reddish purple fall shades. Does not need pruning, is deer resistant and wet site tolerant; Tiny Wine® is a big step forward for Physocarpus. The fragrant white flowers of 'Mountain Fire' Japanese Pieris appear in March and April, with bright red new growth appearing on top of the shiny green, evergreen foliage almost all summer. 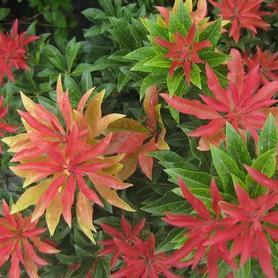 The color of Pieris japonica 'Mountain Fire' make it look like a very refined Photinia. Explamation!™ ('Morton Circle') London Planetree is a hybrid selection by Dr George Ware at the Morton Arboretum. The controlled cross is between our native Sycamore and the Asian species. Platanus x acerifolia Explamation!™ gets its name for its very upright pyramidal in the winter landscape. In addition to its very upright regular straight habit, Explamation!™ is also resistant to both Anthracnose and frost cracking, so it makes a very versatile fast growing shade tree which tolerates a broad spectrum of site conditions. Introduced by Chicagolad Grows®. 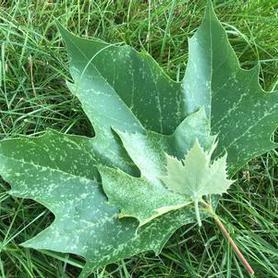 Variegated London Planetree has green and white foliage, but the most striking characteristic is its brilliant white bark. Like the well-known street tree Platanus x acerifolius, the bark color is revealed when the exfoliating bark drops off. Platanus 'Suttneri' would perform well as a street tree, but the beauty of its bark makes it a great looking candidate as a specimen, displayed against a green backdrop. The first one we've seen has been grown for a number of years at Rare Find Nursery in Jackson, NJ. Chinese Pearlbloom is a very unusual small tree originally brought from China by E H (‘Chinese’) Wilson to the Arnold Arboretum. A distant relative of Idesia, Poliothyrsis has wonderful late summer flower interest, with airy ivory pyramidal clusters crowning the clean green foliage. The showy flower racemes are produced on reddish stems in August and September on current year’s growth. The effect is similar to a very late-blooming tree Lilac. The fall color is an attractive yellow, with interesting brown lilac-like seed capsules. The winter bark is a brownish gray. The Scott Arboretum has several amazing specimens in their collection. 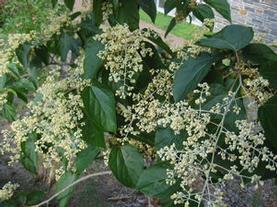 Can be grown as a medium sized tree or a very large shrub. 'Flying Dragon' Hardy Orange (syn. 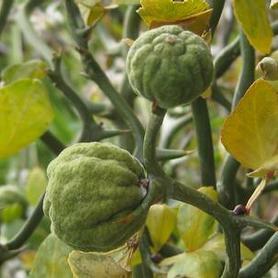 'Monstrosa') is a citrus that can actually be grown in the Northeast. The fruits are golf ball sized yellow-gold oranges in the fall that can be made into a very tart marmalade (lots of sugar needed). The deliciously fragrant white flowers are bourne on the deep green contorted, thorny stems in April and May. The twigs are ornamental for both structure and color in the winter. Just make sure Poncirus 'Flying Dragon' is not planted near play areas, as the thorns are significant. 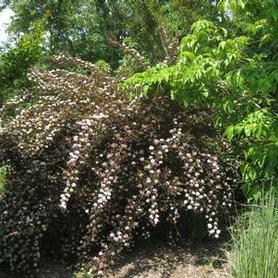 Bush Cherry blooms in early spring, when its shrubby branches become covered with bright pink blossoms. The flower display is often followed by small red fruit which is attractive to wildlife. The fall color is a good yellow. Since Prunus jacqunemontii is a very early spring bloomer, it makes a great cut branch for early forcing. Another common name is 'Afghan Cherry'. The dark green evergreen foliage of 'Otto Luykens' Common Cherry Laurel is compact, topped with highly fragrant white flowers in April and May. Prunus laurocerasus 'Otto Luykens' is an excellent broadleaf evergreen for shady locations with deer problems. It tolerates salt spray well. Introduced by Hesse Nurseries of Germany. 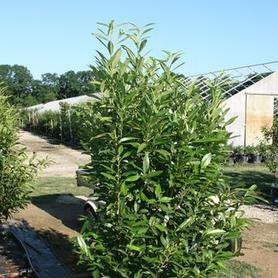 Skip Laurel has large smooth shiny green leaves on a broad upright evergreen plant. 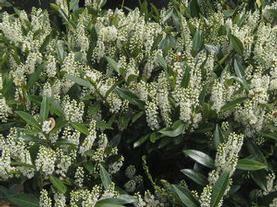 Prunus laurocerasus 'Schipkaensis' has strongly scented white flowers in April and May. Believed to have come from Bulgaria in the 1880s. The large deep pink double flowers of 'Kwanzan' Cherry hang from branches in April as the coppery new growth is emerging. Blossoms are so full that they look like ballet skirts. The foliage of Prunus serrulata 'Kwanzan' is a good green in summer, turning to lovely shades of yellow and orange in fall. 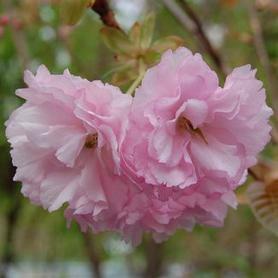 Autumn Flowering Cherry has dark pink buds that open in early April to pale pink semi-double flowers. It will lightly rebloom in the fall. 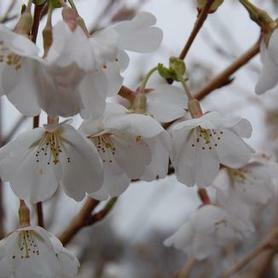 Prunus subhirtella 'Autumnalis' is an unusual small ornamental tree, with neat, small leaves. 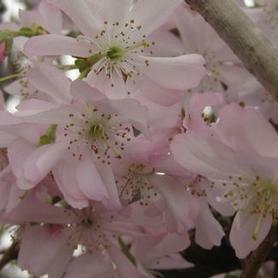 Prunus x yedoensis has soft pink flowers that open before the foliage emerges in early April. 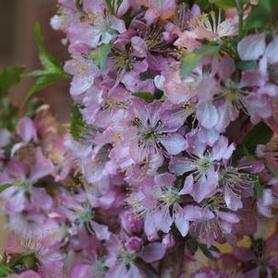 'Yoshino' Cherry makes up the famous Cherry Blossom display in Washington DC along with 'Kwanzan' Cherry. Fall foliage is yellow to orange.